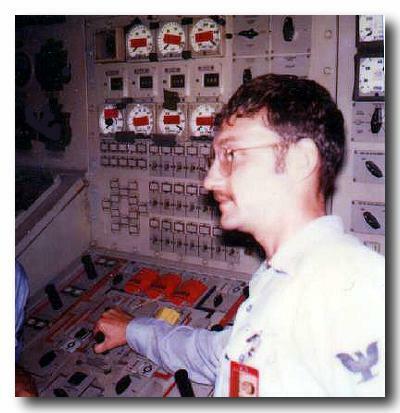 This is Electronics Mate Second Class Tegenkamp holding the rod control switch at the reactor plant control panel in the maneuvering room, the nuclear control room aft. On the vertical face are the power meters, the startup range meter, intermediate range meter, and power range meter. Below them are the average coolant temperature meter, the pressurizer level meter. Lower left on the vertical section are the control rod bottom lights, which show if a rod has dropped or if a group scram or full scram has happened, where scram is the term describing a reactor trip where the neutron-absorbing hafnium control rods shut down the nuclear fission reactions and shut down the plant. To the left of the upper row of power meters is a box with a Plexiglas cover over it, the reactor scram switch, which will insert a group scram or full scram. Scram stands for "safety control rod ax man," the ancient term for the way a carbon moderated lab reactor was shut down in the old days when Fermi had first put a reactor together. This plant's control rods were slammed into the reactor vessel by springs when the rod drives were disconnected by the scram switch. On the tilting section of the console are the pump switches, three per side in each coolant loop, the main coolant reactor loop cutout valves, and in the center, the rod control switch. The rod control switch will pull rods out of the core to raise power or insert them slowly to lower power. The reason Tegenkamp is holding the switch is that he is explaining what happened the day of our "incident." Tegenkamp was on watch the fateful day we almost melted the core. I was the engineering officer of the watch at sea, 400 feet beneath the Atlantic, with an under-instruction officer running the plant. We did the scram drill, and the fast recovery startup was going adequately, with Tegenkamp pulling on the rod control switch to bring power out of the basement when suddenly the rod control switch broke off in his hand. The executive officer, there as a drill monitor, stopped the drill, and the chief engineer - not Ray Lincoln, but his predecessor - also monitoring the drill, took over from the under instruction engineering officer of the watch. While we looked for a screwdriver to replace the rod switch, what we didn't know was that the rod switch had stuck in the rods-out position, and even though the pistol grip no longer was attached, the rods were coming out of the core. The reactor had run away. The term for this incident is a control rod withdrawal accident (CRWA). Power levels came screaming into the power range. We were, by later engineering calculations, six seconds away from a steam explosion when all three channels of the nuclear protection tripped the plant on high startup rate. Had we not had the second scram, the steam explosion would have been sufficient to breach the hull. Our lucky day at sea.